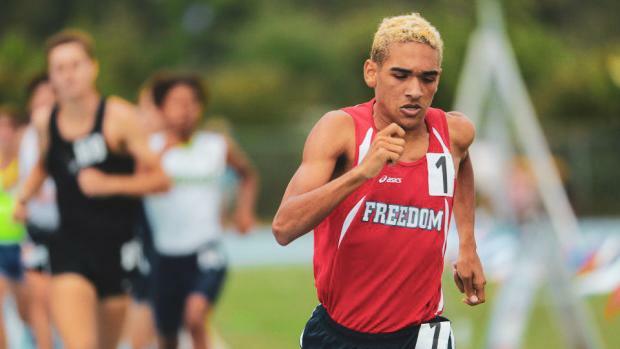 You may remember Timothy Doyle from his three 1600m state championships over the past few years, but former the Freedom HS standout isn't done yet. Doyle, only a freshman at the University of North Florida, is making a huge impact in college in his first year competing. At the UNF Spring Break Invitational, Doyle ran a personal best of 3:50.97 in the 1500m -- one of the top times produced by a freshman in the NCAA this season. Doyle started off his college career strong by helping the Ospreys claim their second ever ASUN Cross Country Conference Championship back in October. As a middle-distance specialist, Doyle started to roll in indoor track as he ran 4:12.94 for the mile and 1:52.18 in the 800m. His most noted performance of his college career thus far was his second place finish at the North Florida Spring Break Invitational in the 1500m. For context, a 3:50 1500m converts to about a 4:08-4:09 mile -- that's nearly four seconds off his 4:13 1600m personal best that he ran only a few months prior to college. In an exciting race at Hodges Stadium, Doyle remained calm for the first few laps, staying in the chase pack and knowing his racing strengths. "I wanted to make sure to feel comfortable in the first 600 meters," Doyle said. Once the bell lap rang Doyle turned on his signature kick which is ever so familiar if you've seen him race in high school, unofficially splitting 57.2 for the last lap. "By 400m I ended up feeling pretty good and I saw my teammate Noah Perkins about 40m ahead and it was just him by himself up there, so I told myself why not just shoot up there and help him out," Doyle said. "So, I ended up pulling up on the back stretch. I was like 13th place with a lap to go and with 200m left I was in the top 5. With about 150m to go I was right next to first place." The transition from high school to college is not always the simplest or the easiest. You're living in a new place, have a new sleeping schedule, a brand new coach, and even the rigor of school itself is an adjustment. Doyle knew that this new journey would be an adjustment and accredited his transition to the help and guidance of his coach, Jeff Pigg. "Coach Pigg has done a great job helping me transition from high school to college. You can see a lot of athlete's struggle with that. We both made it clear that coming that we would make sure I stay healthy -- bumping up the mileage just a little bit from what I did in high school," Doyle said. "Now in college the workouts are a little more intense. It's all about keeping steady mileage throughout the weeks of training and such." Focusing on the little things like stretching and foam rolling along with getting adequate sleep have helped Doyle through this transition while staying healthy on the track and in school. "Doyle is the kind of guy that came in with the burden of being a real good high school runner. Many times, those guys who are highly recruited and are really successful are saddled with a lot of expectation," Coach Pigg said. "He worked hard in the summer, did a great job in cross country. We know that that strength leads to success on the track." To be successful in all aspects of life, it is important to help create a positive atmosphere for you and the people around you and the University of North Florida cross country and track teams have created a team culture surrounded around hard work and both excellence on the track and in the classroom. "His positive attitude is something that definitely affects everyone around him and makes the team better because of it," fellow UNF teammate and Hagerty HS alumnus, Andrew Stivers, said. The transition from high school to college athletics can often be a struggle for top athletes who come into a program with great expectations and the pressure to stay healthy to succeed at the next level. 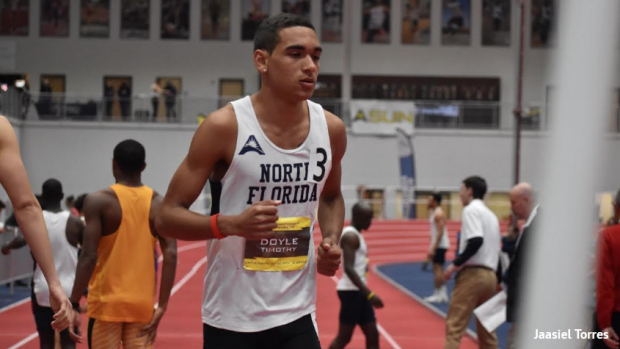 After winning multiple state championship titles and being one of the best middle-distance athletes in his recruiting class in the state of Florida, Doyle made sure to make it a priority to put himself in situations and an atmosphere that would foster growth and excellence. "We got a great group of guys," Doyle said. There's about 13 of us and we all contribute to make it great. The environment we work to make is a great environment."